This is a favourite for all the family and, my grand-daughter Leila says it is even better than party food and requests it for dinner whenever they are coming over! Mind you, for an eight year old she does have very savoury tastes and snacks on feta cheese, olives and basil leaves! This is one of those ‘one pan dishes’, very easy to make and most delicious to eat. The secret is in the quality of the ingredients – fresh, free-range chicken is a must. 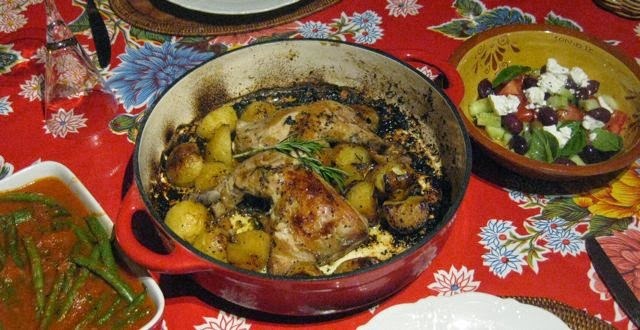 This kind of dish is served all over Greece, particularly with home-grown rooster, and lots of lemon, black pepper, garlic and rosemary for that distinctive Greek flavour. If you recognise this shot, you have seen the movie! 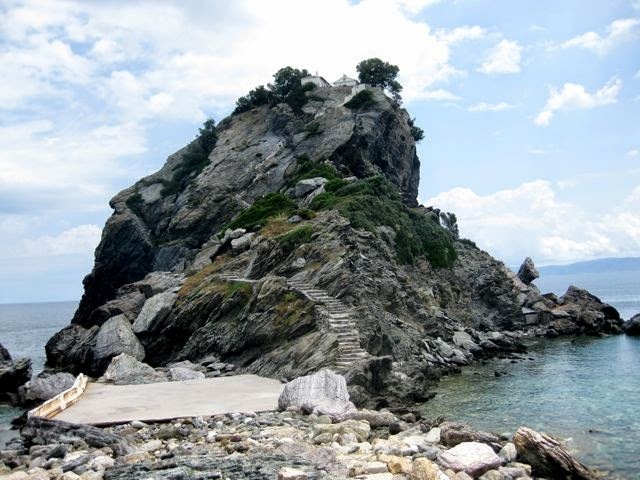 In 2010, I had a special birthday with a ‘0’ and decided to celebrate with some friends and had an unforgettable ‘Mumma Mia’ birthday on the Greek Islands of Skiathos and Skopelos, where they made the movie starring Meryl Streep and Pierce Brosnan. 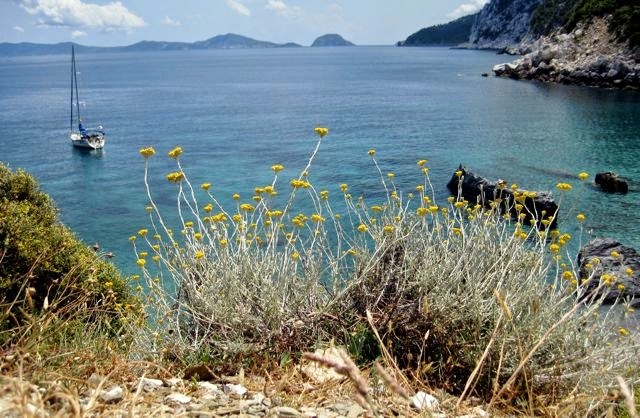 These are part of the northern Aegean Sporadic Islands and were distinctive from their neighbours in the Cyclades by being very green and tree covered. 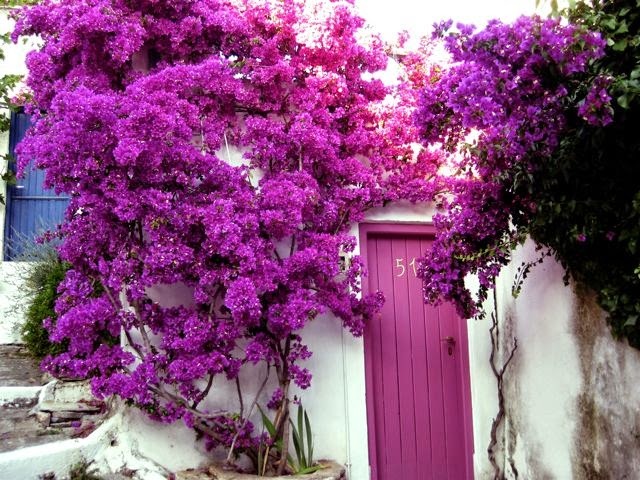 Every one of the 300+ Greek Islands are unique and, for the adventurous traveller, that’s the exciting thing about them. If you don’t like this one, well, move on to the next! 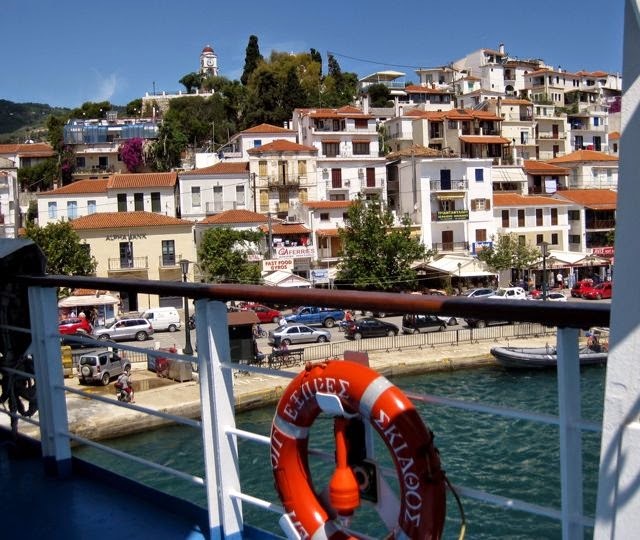 While not really enjoying Skiathos, because it was too touristy, we found heaven on Skopelos at the Adrina Hotel – where the location, beautiful room and food put a smile on all of our faces. We savoured lots AND lots of the local food and we quickly dubbed this island ‘Skoffalot’. NOTE: If you are in this part of the world it is worth taking a trip to the next island in this group, Alonnisos – a step back (or up, depending on how you look at it!) in peacefulness and beauty and, for some reason, a favourite with Norwegian travellers. We had a great time there and enjoyed lots walking, swimming of yummy food! 2. Put everything in the bottom of a non-reactive casserole dish, apart from the chicken, carrots and potatoes, mix together until combined. 3. Place the chicken, skin side down in the marinade and spoon some into the cavities in the top covering all of the chicken. 4. Toss in the potatoes around the edge and turn them over in the marinade. 5. Cover with a lid or foil and place in the oven for 35 minutes. 6. Take out of oven and remove lid. Turn the chicken and potatoes over so that they can brown. Return to the oven for a further 20-25 minutess until chicken and potatoes are golden brown and cooked through. 7. Have a glass of ouzo while the aromas waft around the house. 8. Make a Greek salad to have with this deliciously ‘sticky’ and tangy chicken dish. NOTE: The carrots take on a really delicious flavour from this lemony marinade – prepare for a tastebud sensation! 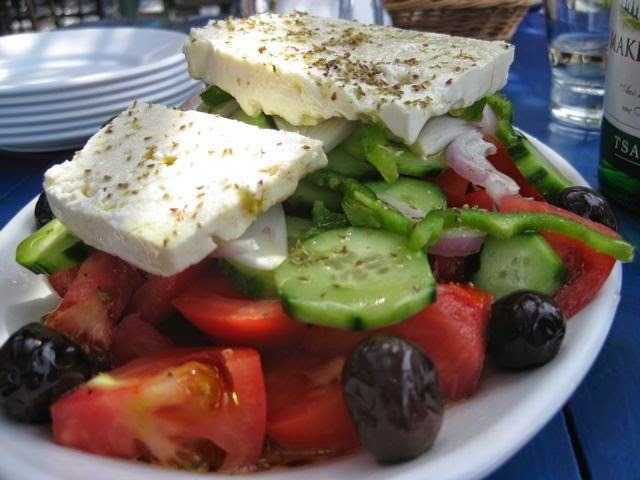 Greek salad, made with ripe tomatoes, cucumbers, olives, red onion, a slab of local feta, sprinkle of herbs, salt and pepper, squeeze of lemon juice and good olive oil. 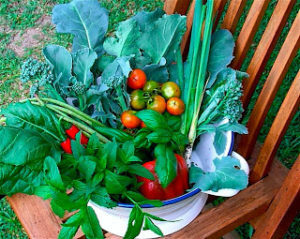 This is a salad that requires honesty – only use seasonal and good quality ingredients otherwise it will taste like all of those Greek salads offered up in fast food outlets – dead and tasteless – this is what the ‘slow food’ bit means in web site! 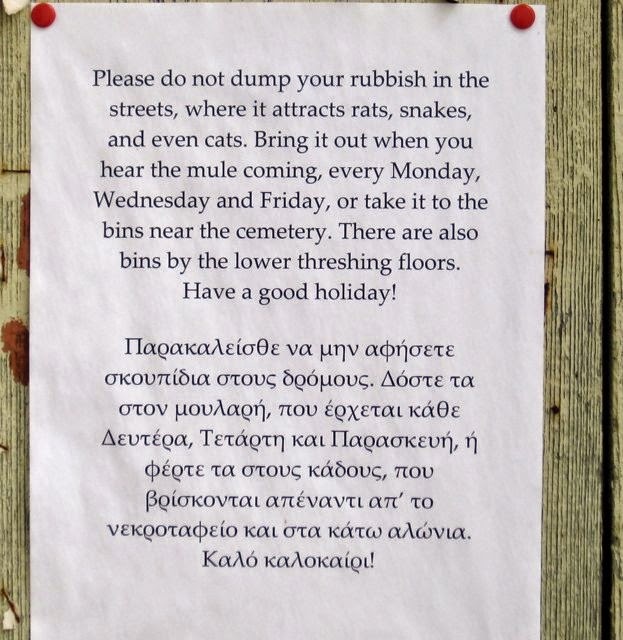 Sign in the village square on Allonissos – I think of this every time I am putting the garbage out! Greek lemon chicken – great to cook at home, but better on a Greek Island. (You can probably tell that I am not going this year so am feeling a little nostalgic!) Kali orexi!